In the late 1950s, I loved going with my older brother Warren to the barbershop. It was an old-fashioned place, large, dark, and manly, three hydraulic chairs in front of a long bank of mirrors with exotic bottles lined up along the shelf below. The unvarnished wooden floor was black with years of footprints and the cavernous green walls were heavily stained from cigarette smoke. This was the domain of men, men both big and small. I was an outsider and knew it, so the barber shop held a compelling fascination for me, like some exotic foreign island I could visit from time to time but never inhabit. In the front section of the building was the barber shop itself. The side with the barber chairs brightly lit, the opposite wall where I sat on a deacons bench, dark and shadowy like the rest of the building. Midway through the room ran a low open railing with a sort of gate at the gloomy side of the room. Beyond that barrier lay the pool hall. If the barber shop was an exotic island, the pool hall was the 9th circle of Hell. You simply didn’t go there. It was too dangerous, tinged with sin, full of riffraff. And, as such, was just about the most alluring place a five-year old girl could ever hope to see. The smoke, the dim lights, the crack of balls smacking against each other, blue chalk and mysterious red cubes shaken from oddly shaped containers kept me fascinated while my brother was on the chair. Some part of me knew I should be paying attention to my brother and Mr. Bill Upchurch the barber, but my eyes and ears were constantly drawn to the dark smoky richness behind the barricade. As children we were not allowed to pass the gate except to go to the Coke machine. Mr. Bill must have felt the strength of that pull to wickedness because invariably he would open the cash register and give me two nickels, one for me, one for Warren, and I would open the gate and step into that other world gingerly and breathlessly. Sometimes, though not often, an older boy with slicked back hair and a pack of cigarettes tucked into a rolled up shirt sleeve would look up past pool cue and bulging bicep to grunt some word of acknowledgment before returning to the concentration of the game. I was insignificant to him, but that moment of being seen was heady stuff for me. I was thrilled. I’d go back to my seat on the other side occasionally climbing up to the red leather banquette where businessmen came to read the newspaper while a tiny old black man rubbed paste wax on the their shoes, buffing and polishing like a machine, which is how he was often treated by his customers. From time to time he would be present during Warren’s haircut. He would smile and help me up to the leather bench that floated high above my head and once treated my tiny brown oxfords to a professional shine. Like as not, once I got my Coke, Mr. Bill would hand me a pack of salted peanuts to go with my drink. A Coke was good, but a Coke with peanuts was pure heavenly delight. I’d open the package with my teeth and pour part of the nuts into the cocola as we all called it. Then I’d take a big swig of liquid, filling my mouth with peanuts as well. What a taste sensation; sweet and salty, liquid and crunchy, rich and mouth filling. By this time Warren would be finished with his haircut, dusted off with talc and doused with cheap perfume. He’d come over to my perch, climb up and enjoy refreshment and entertainment with me. We were both loath to leave, knowing it would be weeks before we got to reenter this wonderland. 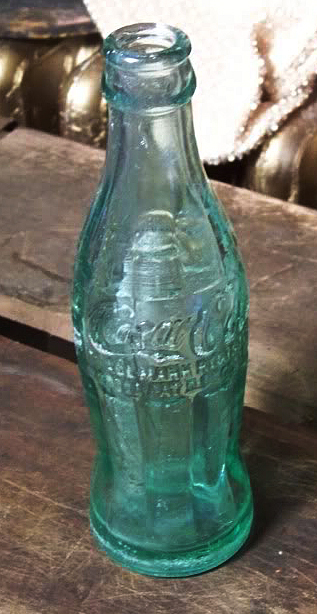 And so, to pass more time, we began to pull Coke bottles. The Coke machine was big and red: retro versions have popped up all over the place in the past decade or so, but this was the real thing. You put in your nickel, you pressed the button (there was only one) and an ice cold drink clanked through the metal flap at the bottom into a trough awaiting pick up. A wall-mounted bottle opener was attached to the railing between barber shop and pool hall, and to the left of the machine itself was a tall (at least for a 5-year old) rack with angled slots where people would place their empty bottles. Beside that were wooden crates where the bottles would eventually be organized for return to the bottling plant, our nearest being Goldsboro, North Carolina, a mere 20 minutes up the road. It was the angled metal rack that was important. The bottles went in base-side down. This way any unconsumed liquid stayed in the bottle rather than spill on the floor. Only the bottle necks were visible and accessible. The bottom of each bottle was embossed with the name of the town where the bottle originated. Because we were so close to a bottling plant, most of the bottles in our rack came from Goldsboro, most, but not all. Coke bottles were surprisingly mobile in those days. You might pull a bottle from Oxford, Mississippi or Little Rock, Arkansas. It was the custom of the pool players when not betting on their own games to bet on the bottles from the rack. Greatest distance from Mt. Olive won the bet. An ancient map of the continental United States hung above the rack to aid in settling any confrontations about whose bottle had travelled the farthest. I started pulling bottles before I could even read. Warren and I would each choose carefully, draw the bottle from its resting place then take them over to Mr. Bill who would read out the names for us. Exotic locations blossomed before us as those names were read out. Jacksonville, NC; Savannah, GA; Charleston, SC; and my personal favorite, Tuscaloosa, AL. Oh, those names, musical and magical. I knew one day I would see those places. I felt it deep in my tissue and bones; I would see the world. I have gone much farther than Tuscaloosa in the ensuing years. The wanderlust imprinted on my soul is just as palpable as the embossing on those bottles. The excitement I feel seeing each new place is the same sense of wonder I had at five hearing their names read aloud. Travel has never disappointed me. Perhaps I owe it all to the Coca Cola bottlers of the South, and if that’s the case, I humbly thank them. What great memories, Wendy! I haven’t thought of reading the bottom of Coke bottles in years. When are you visiting Itsy at MHC? I would love to see you.